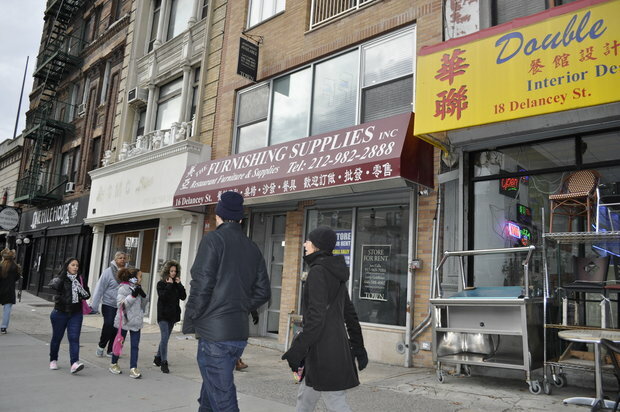 If you want to get a jump on the latest developments in machine intelligence, head down to where Manhattan's Lower East Side borders Chinatown, a still-gritty but gentrifying neighborhood where hip coffee houses are springing up next to industrial-supply outlets and wholesale stores. The location, an area in the midst of transition and modernization, is a fitting spot for Fast Forward Labs, a startup founded to help companies innovate and compete using what founder and CEO Hilary Mason calls "recently possible" machine intelligence techniques and technology. Fast Forward Labs has an unusual business model. It produces quarterly reports on emerging -- or what Mason calls "near future" -- technology, builds prototypes to demonstrate the technology, and offers advisory services. The business is based on a subscription model: For an annual fee, clients get access to the reports and prototypes plus time with Mason and her colleagues, who guide them on how to apply the technology to their own businesses. "The role we play here is basically we're their nerd best friend," Mason says. The basic idea is to help businesses accelerate their data science and machine intelligence capabilities. Fast Forward Lab’s eight-person team has attracted attention in a burgeoning market for machine-intelligence oriented vendors, consultancies and market research firms, largely on the strength of Mason's industry profile and unique approach to research – several publications including The Wall Street Journal have called her a "big data rock star." Fast Forward Labs looks out from above a vacant restaurant furnishings store on to a Manhattan Lower East Side neighborhood in transition. Before founding Fast Forward Labs in 2014, Mason held the chief scientist position at URL-shortening company Bitly and over the last few years has been in the Fortune "40 under 40 Ones To Watch," among other such lists. Mason says she started programming at age five, but her star has risen not just on the strength of her technical skills. She has a humanistic approach to data science, an engaging public speaking style, and the ability to make abstruse topics accessible to non-experts. As a data scientist, "you really need to have a lot of empathy for the work you're doing and the people who you're ultimately trying to help whether that's a business colleague, a boss, or ultimately the user of the software you're building," Mason says. Technologies explored by Fast Forward Labs so far include natural language generation, with a prototype that automatically creates real estate listings with full sentences, based on a list of attributes users click on. The company has also examined probabilistic methods for analyzing real-time streams, with a prototype that displays popular topics across Twitter and Reddit as nodes in a dynamically changing graph. A more recent report delves into deep learning -- an algorithmic family of techniques, based on highly connected neural networks -- as applied to image analysis, with prototypes that identify images in Instagram photos, categorize them, show them in pictograph form and display users' top interests. (If you are into Instagram, you can have some fun playing around with a public, simplified version of the prototype here. Mason has called Fast Forward Labs "my current hack," an attempt to fill gaps in how new technology develops in established companies, academia and startups. "I believe there are a lot of inefficiencies in the way technical innovation happens," Mason says. For example, she notes, there is "friction" for people who want to do something different in established enterprises with successful products. "We sit in the middle of the enterprise, the startups, and the research community, and we look through those things that have just become possible and interesting and then we try to make them useful to our clients who have data, have a business, understand those things very well and are looking for growth opportunities," she says. The company does not write code for clients, but advises them on topics including system architecture and how to build a team around data science. Increasingly, enterprises are competing and innovating by analyzing data they have collected to optimize decision making, using advanced analytics and machine-learning algorithms. "By 2018 over half of large organizations globally will compete using advanced analytics and proprietary algorithms, causing the disruption of entire industries" market research firm Gartner said in a recent report authored by analyst Jim Hare. Companies are starting to use statistical analysis, predictive modeling and decision optimization as ways to compete, Hare wrote. A key piece of what Fast Forward Labs does is to find machine intelligence techniques that are interesting and are becoming possible to do in real-life business scenarios, but which have not yet been commoditized -- a condition that can create a competitive advantage for companies that are early adapters of new technology. Though the Fast Forward Labs team is small, that fact that the members have varied backgrounds helps them cast a wide net when looking for new topics to explore, says Ryan Micallef, one of the staff. Micallef himself started out as a programmer out of college, but then went to law school and became a patent lawyer. 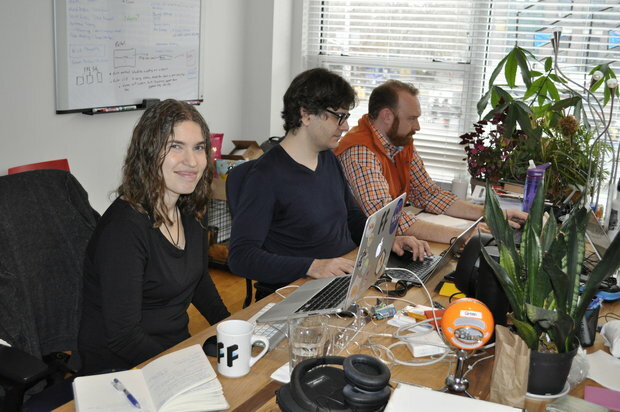 Fast Forward Labs CEO Hilary Mason, left, in her office with team members, from left to right, Nick Vermeer and Ryan Micallef. To identify new technologies to focus on, "We take notes when we see things that catch our eye, then we scrub that list down," Micallef says. "We look at where things are, where something has reached a tipping point economically or technically, find the points where things have made a leap forward but haven't become a commodity such that they can be bought off a shelf." Many of Mason's clients are CIOs and other leaders in tech roles, such as CTOs (chief technology officers) and heads of R&D. Mason says she has seen a change in what tech leaders are expected to do for their businesses. "Now, they're being called to actually have a vision for what the business can be capable of through the technology." Tech leaders now have to collaborate with business leaders, and bring in the right technology to support a shared vision. This is especially true in the area of data analysis, where technology is essential for doing good work, Mason notes. It also puts tech executives in a position where they need a strategy, and to be leaders in a way that perhaps they didn't have to in earlier days, Mason says. While there is a tremendous amount of personalization of technology in the consumer arena, the same is not so true for the business world, especially for data technology. "You can go build yourself a Hadoop cluster but whether you build that virtually or on physical hardware, how many nodes you need, what kind of queue management you have and what kind of analytics you're expected to do is not obvious and it's not something you can just buy," Mason said. "Now, you're using this data technology to support your business priorities and if you're doing it well you're going to be not just supporting them, you're going into actually innovating; and so that's something where strong technology leadership is actually necessary for success." Fast Forward Labs has tech executives from a variety of industries among its client base, including insurance, banking, publishing, media, and startups. But whether the client is an established enterprise or a small startup, the company starts the conversation about data by asking a series of defined questions. "Process is very important because otherwise you it ends up being a mess -- you end up duplicating a lot of work," Mason cautions. There are three basic questions about data every company should be asking themselves. The first is simply, "what data do we have?" This is not necessarily a simple task, especially for large business with multiple departments and silos of information. Fast Forward Labs has clients look at their products and write down the sort of data they collect. The process includes checking servers to confirm what data is stored. The second question is, what data should the company have that it currently does not? Businesses should reflect on how the business operates, and the sort of questions that might provide answers that could generate growth. Companies should also look ahead and figure out how they would store new data they could collect, for example in Hadoop clusters, on site in internal servers, or on a platform like Amazon S3. Finally, the Fast Forward Labs team asks companies about the assumptions they have made about their business that can be validated with data. Many companies have intuitions about how to penetrate markets and opportunities for their products. Data analysis can verify -- or challenge - such assumptions. "I always find when you start with those things you probably already know, you will probably confirm most of what you know but will start to learn things that you didn't know," Mason says. "Once you start asking questions and getting useful answers the process grows -- once you've got a few good questions you will end up with many more." Looking ahead, Mason says the path for Fast Forward Labs is not to simply add more staff, even though there are big market research companies, consultancies and vendors that are jumping on the machine intelligence and data science bandwagons. "There's a great energy when you have a team that's less than 15 where you sort of know what everyone's up to and there's not a lot of bureaucracy," she says. So far the company business model has worked: After putting in some of her own money and not taking a salary for a while, Mason now pays herself and says the company is profitable. Mason has tweaked the company business model a bit, offering options other than the annual subscription. Fast Forward Labs just made its natural language generation report available on a tiered-pricing basis, from $250 for a short, basic version, up to $5,000 for a version that includes the prototype and consulting time with the company. Mason's ambition, however, is to rethink applied research on a broader scale -- how people bring new technical capabilities into organizations and how to find growth opportunities around those capabilities. "I believe there's something valuable in our model of applied research and advising that can be applied even outside of the world of strictly data -- but that's an experiment we will be doing in a couple of years." --Over-investing in technical infrastructure. Many companies spend money on technology without knowing what they're going to do with it. "I have seen organizations spend millions of dollars on hardware and software without really a plan," Mason says. -- Failure in leadership. Businesses need someone who can cut through politics around who owns the data and what silo of the business is in control of it. Businesses need both strong practitioners -- people who will actually do the work -- but they also need somebody who is capable of giving them the power to get the work done. "I've never seen an effort succeed unless it had strong leadership," Mason says.